Buddhism is one of six official religions recognized by the Indonesian government. It is the second oldest religion in Indonesia. 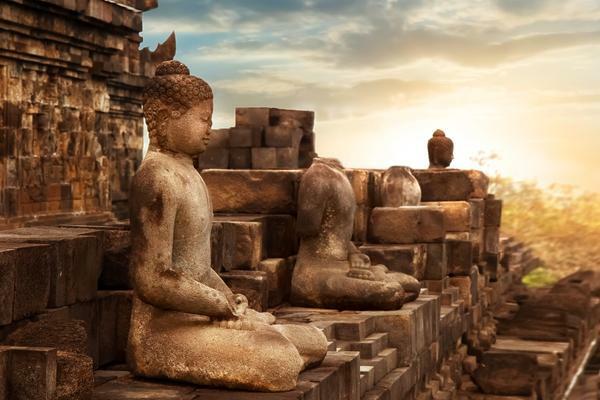 Remains of the Buddhist era are still existent, like the magnificent Borobudur temple in Central Java. At the end of the sixteen century, Islam finally supplanted Hinduism and Buddhism, and religious sites and temples were then abandoned. Only one percent of the Indonesian population claims to be Buddhist. That means two or three million people and most of them belong to the Chinese minority. Although only a small proportion of Indonesians follows Buddhism, the Hindu-Buddhist heritage is truly important to today’s society. Nowadays, Vesak or Waisak festival is the main religious event for Indonesian Buddhists. On the evening of the full moon day in the month of May, Indonesian and worldwide devout Buddhists gather at Borobudur temple to commemorate Buddha’s life. Animism and indigenous beliefs in Indonesia.